‘The blue infinite’. 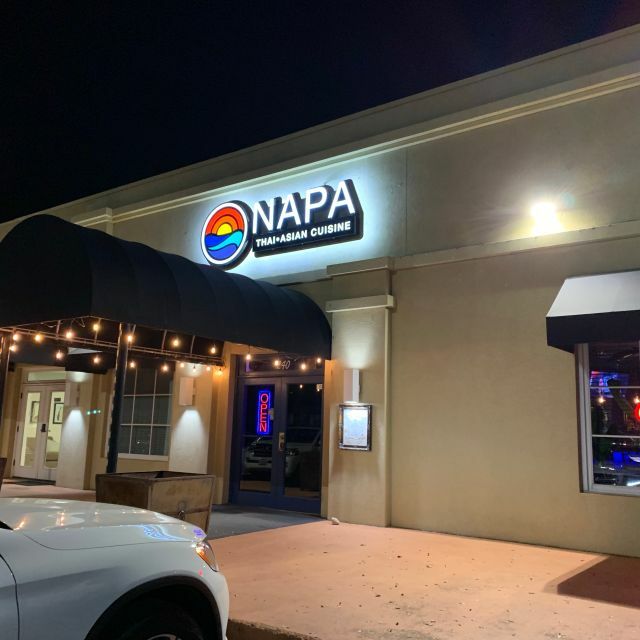 “NAPA” Thai Cuisine was founded in June 2018 by a Thai family owned enterprise and renowned for its authentic Thai dishes. The a la carte dishes derived from authentic recipes which have been adapted into a modern context suitable for NAPA’s dining ambience. “NAPA” combines the highest quality ingredients and age old recipes, thus, in this regard “NAPA” is truly Thai in spirit. 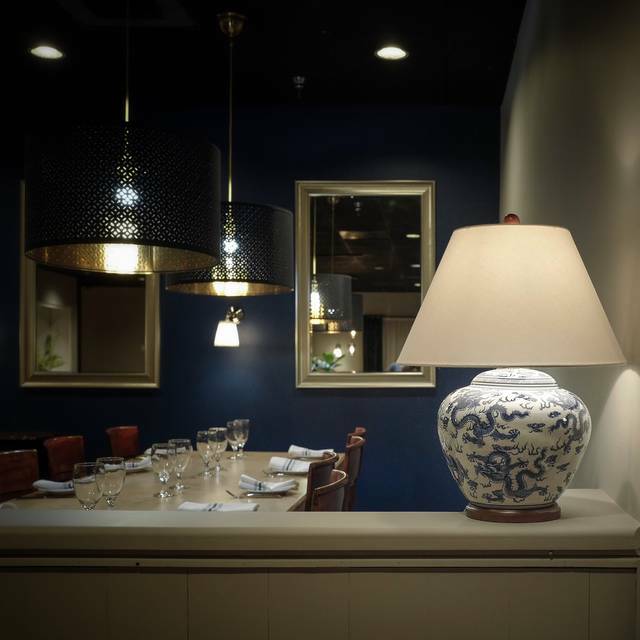 NAPA is a restaurant where anybody; whether local, expatriates or tourists, with a passion for Thai food can experience authentic Thai cuisine in a relaxing ambience with friendly services. Lovely spot for lunch or dinner. The patio is beautiful, lush and green. The ambiance indoors is elegant and clean. The food was delicious. Lots of variety on the menu, everything fresh, and prepared as ordered. The service incredible. My only recommendation - if you have any aversion to spice, be sure to ask for mild. I love a spicy curry, so I am thrilled to have this option close to home! Amazing food and wonderful people! It was our first time and we loved it. Hands down the best Thai restaurant in the area. The atmosphere has a classy vibe and the ambient music is wonderful. 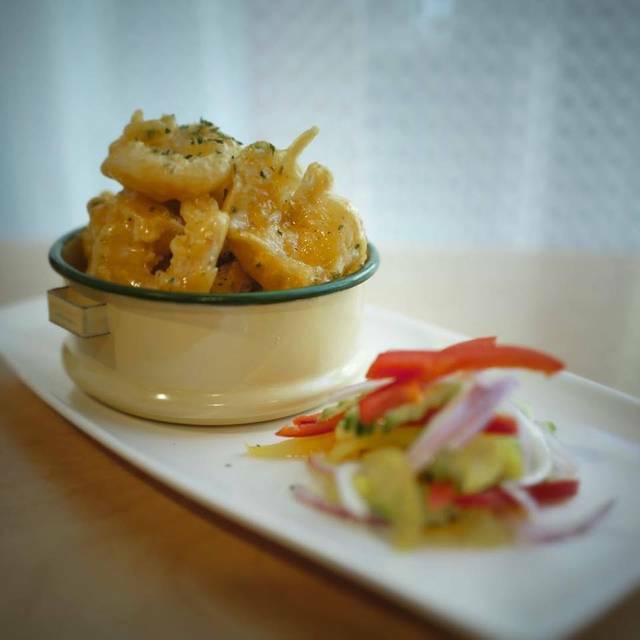 The food is not only flavorful, but artfully presented. I love that the plates themselves are hot, so the food stays warm throughout the entire meal. All of the servers are friendly and attentive. The bar tender came to the table to check on the quality of our drinks too. Lastly, they offer an ipad which displays photos of the food to help in making your choice of entree. Can’t say enough good things about this restaurant!!! We’ve been there three times in two weeks! Good clean place. Food was good. Ad usual, fantastic! Naps Thai has become our favorite dinner place! The food is so good, service is always so nice and pleasant. This is s great place for lunch or donner. Any time, any occasion! Awesome ! Had a reservation & we were seated immediately. Food was exceptional as was the service. Pleasant decor & cute bar area. Highly recommend!!! Been to Napa Thai a few times now and the food and service is excellent. Love the ambiance, decor and the attention to detail. A little pricey but very good food. Restaurant was nice and quiet. we will definitely return. The food was the delicious and the atmosphere peaceful and modern. Very nice decor and good food. Had a very nice dinner with the family. Good wine list too. Will definitely be back! Higher end dining experience. Not a vegan restaurant but a few good options and they are willing to modify dishes to suit. Nice place for a date or a special meal. My wife and I ordered the mussels and steamed dumplings for appetizers; red curry chicken and pepper steak filet mignon for our main courses. The food was outstanding. Although we weren't given the choice for the level of spice, the curry chicken came at a 3 of 5, which was perfect for us. The steak was a 1 of 5. It was ordered medium but came rare and was taken and returned cooked perfectly. I had to ask again for my tea to be delivered half way through the meal. The house wine was excellent (only $5 till 7PM). The mussels were so good we ate the broth like soup. The freshness of the ingredients and the wonderful blend of flavors together made for a delicious meal. Will definitely return. Excellent service. Great decor! Food was good and the proportions were just right. This place knocked it out of the park. Sea Bass was great. Pei Muscles were great. Fried Brussels were great. Pepper filet was great. Duck was awesome. Once a month for us now. The food was so good! Very authentic. Great menu. Had the Pad Thai chicken, beef tenderloin stir fry and chicken fried rice. All were delicious!! Will definitely be back soon!! Food and service was amazing. What a gem. 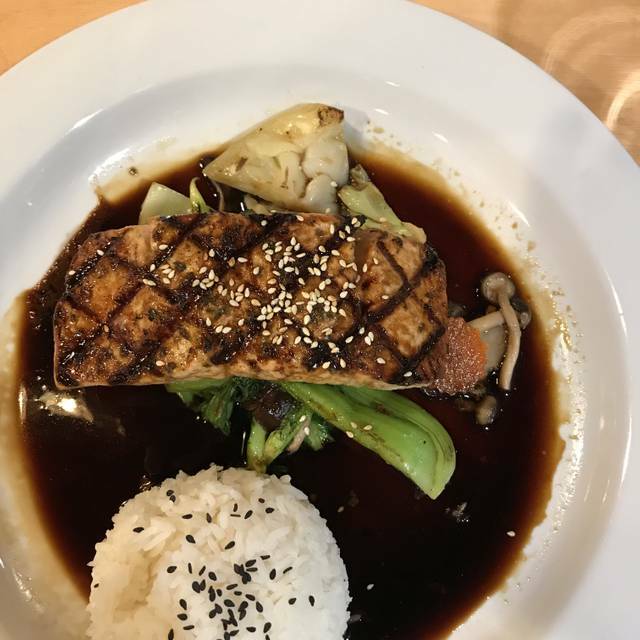 Service was very slow this visit and the food not quite up to par compared to previous visits. We celebrated Valentine's Day there, it was also our very first visit. The menu was pre-fixed, but had enough options, from entrees to desert. We loved the food, it was delicious, good portions, well prepared. Service was great , the waiter was attentive. The only minus was the bartender, who was the slowest person to make drinks. After 25 minutes of waiting the first round, he still has not made our drinks, he was not swapped in any way, because most people drank wine with their meals. The second round of drinks took closer to an hour to deliver. Otherwise, everything was perfect. We will be back. Napa went all out with the menu to make Valentines Day special for us. The dishes were creative and outstanding. Especially enjoyed the Brussel Sprouts appetizer the Cripsy Duck entrée. 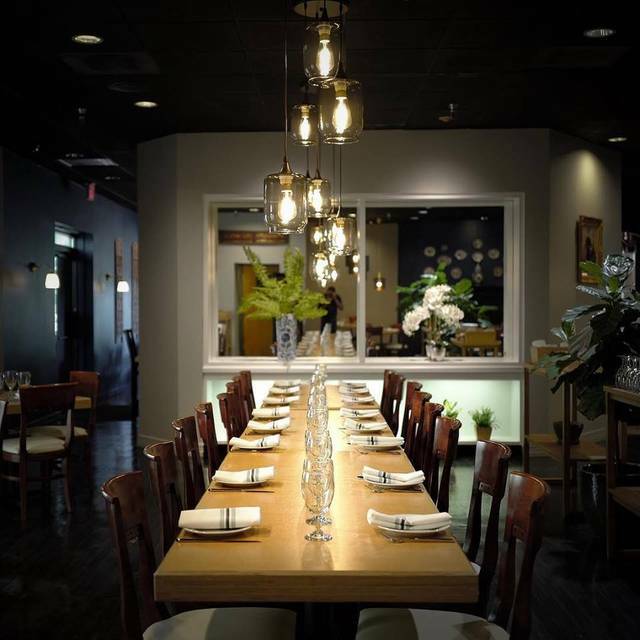 Our Valentine's Day 2019 event dinner party at NAPA Thai Asian Cuisine in Colleyville was very memorable. Our party of 4 adults was quickly seated and engaged with our server within 60 seconds. She was very polite and professional even though she had several tables to attend to. Our Pre-fix menu Thai food was prepared and presented beautifully and was hot and tasty. The value we each received for our dining was exceptional and we will be going back again, soon! The food and service was absolutely amazing! Lin our server deserves a 5* rating by herself. The steamed dumplings rival what I have experienced in San Francisco! The black pepper filet mignon is what will draw us back again! To finish things off try the strawberry cheesecake. The Cheesecake Factory could learn a thing or two from the Chef! Am all around superb experience from the moment we were greeted at the door to the overall dining experience and ambience of the dining room! Make sure to ask for Lin! This is a top notch restaurant. Best Brussels sprouts I’ve ever had! Great food and service all around! Over ordered to try a number of dishes and everything was delicious. A warm, inviting decor and excellent service capped off the visit. Definitely worth going back. Our dinner was very good. All four of us were very happy with our choices. The service was beyond good. So happy to have found this little gem. Top notch. It was so good! Service was great. It was quiet so you can actually have a conversation with your friends! Highly recommend! My brother came to town with some colleagues and we wanted to take them to a special place. Excellent hidden jewel in Colleyville . Food was delicious, beautiful presentation, and good value. The sign on highway 26 that says Lease available is misleading. Five if us thought that meant Napa was closed. We learned from someone else it was not only open but a great dining opportunity. Indeed it is and we'll be going back often. Great addition to the Colleyville area - a must try for lovers of Thai food dishes. We will be returning! Enjoyable dinner. We had a great time I would recommend it to a friend.